PS4 Slim 500GB Glacier White Console. SAME DAY DISPATCH BEFORE 2PM. What's in the box? 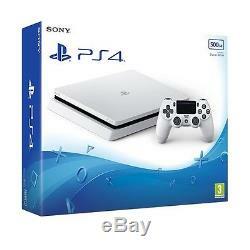 The new Glacier White 500GB PS4. A Glacier White DUALSHOCK 4 Wireless Controller. BLOCKBUSTER GAMES AND PS4 EXCLUSIVES. Looking for the best games? Here's our pick of the big hitters on PlayStation®4... Join Nathan Drake on a perilous hunt for a fabled pirate treasure in Uncharted 4: A Thief's End. Explore the mystery of our natural earth, 1000 years from now where machines rule the world in Horizon: Zero Dawn. Experience Gran Turismo for the first time on PS4 with GT Sport. And get 30 days' early access to map packs in Call of Duty: Infinite Warfare only on PlayStation®4. A slimmer and lighter console with stylish new looks and packed with true PlayStation®4 power. HIGH DYNAMIC RANGE (HDR) TECHNOLOGY. Visuals are more realistic, strikingly vivid and truer to what the human eye sees in the real world. Fast, personal and easier to share, connect and play with friends. Game-changing innovations and ways to keep playing, like Remote Play and Share Play. A built-in Blu-ray Disc player, plus your favourite movies, TV shows and music, whenever you want. All you need is a Sony Entertainment Network account to get started. YouTube, PlayStation Music powered by Spotify, Netflix, TV from Sky, Amazon Instant Video, BBC iPlayer, PlayStation Video, Now TV, IGN, BBC Sport, and many more. You can also play music and video files directly from your home media server or USB storage device with Media Player for PS4. Immerse yourself in extraordinary new worlds, put yourself at the centre of an incredible gaming universe and experience a new way to play with PlayStation VR. Connect the headset to your PS4, add a PlayStation Camera and leave reality behind. Features 2.4GHz/5GHz Wi-Fi mode options and HDMI 2.0 output. Connect to the PlayStation®App through your smartphone or tablet to stay in touch with your gaming universe 24/7 - from shopping on PlayStation®Store to controlling your PS4 remotely or comparing your trophy collection with your friends. Download the PlayStation®App today from the App Store or Google Play. Sign up to PlayStation®Plus to join millions of players in action-packed online multiplayer matchups, get exclusive offers at PlayStation®Store, and download 24 games per year that are yours to play for as long as you're a member. As the world's largest new-generation online gaming community, PlayStation®Plus is where friendships are formed and battles are won. Why we think you'll love PlayStation®Plus. Join your friends in PS4 online multiplayer. Download 24 PS4 games a year. Enjoy exclusive discounts at PlayStation®Store. Get cloud storage for your saved games. Invite your friends to play with Share Play. PlayStation®Plus - it's where the players are. TWO CONSOLES, ONE PS4 FAMILY. Connect with friends on PlayStation®4 and PlayStation®4 Pro consoles, and hook up with the biggest online community of players with PlayStation®Plus. All games are fully cross-compatible with PS4 and PS4 Pro, and players compete online in the same multiplayer ecosystem. 288mm x 265mm x 39mm. 426mm x 355mm x 103mm. DUALSHOCK®4 wireless controller â combining revolutionary features with intuitive design and precise controls, the DUALSHOCK®4 wireless controller defines the new generation of play. Available in a range of colours, including Glacier White. PlayStation®VR - put yourself at the centre of the game and explore extraordinary worlds in a way you've never experienced before. For total immersion, interact with virtual environments using a PlayStation®Move motion controller or DUALSHOCK®4 wireless controller. PlayStation®Camera - integral to the PlayStation®VR experience, the camera tracks the PS VR headset, PlayStation®Move or DUALSHOCK®4 wireless controller to heighten your sense of presence. It also unlocks PS4 features like voice controls, facial recognition and picture-in-picture video editing and broadcasting. This product has no reviews yet, however see what our buyers say about our other products.. Europe / Rest of the World. And follow the below instructions (if you do not have a printer a written form with this same information is fine). Please make sure the item is wrapped securely to avoid damage. Usually the cardboard box in which the product was originally sent in can be used. Disc scratching caused by hardware. FAULTY HARDWARE: For faulty hardware and large items please telephone us on 0844 318 1328 to arrange a collection of your item. Due to the cost incurred in failed collections, if the machine is not ready for collection or the courier receives no answer on the arranged date you will be required to return the item at your own expense. If a small problem such a broken video game case we may be able to replace this directly for you to prevent taking the entire product back. If you do need to return a damaged product we will require the original packaging the item arrived damaged in. This will be completed once we have received and processed the item (please allow up to 14 days). Unfortunately during busy periods such as major game releases and Christmas this can take longer. We understand the frustration that a delayed or lost item can cause but unfortunately we cannot take any action until this time has passed. If the game required an online code this will be in the box. All our games are PAL stock (not NTSC or any other region). If you change your mind, you may return any unopened sealed item at your own expense within 14 days from the date you received the item. Please note we reserve the right to cancel any orders of large multiple quantity. Our listings are not for wholesale purchasing, please see our retail website if you would like to place a large order. The item "PS4 Slim 500GB Glacier White Console" is in sale since Wednesday, February 15, 2017. This item is in the category "Video Games & Consoles\Video Game Consoles". The seller is "shopto_outlet" and is located in UK. This item can be shipped to United Kingdom.